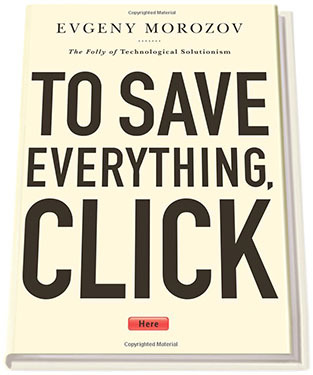 I recently read the most thorough, thoughtful, and cogent treatise on technology that I’ve ever encountered: To Save Everything Click Here: The Folly of Technological Solutionism, by Evgeny Morozov. My attraction to this book is not without bias. Morozov seems to view technology—its potential for both good and ill—much as I do, but the technologies that reside within his purview, the depths to which he’s studied them, and the disciplines on which he draws to understand them, exceed my own. His approach and grasp is that of a philosopher. Alas, all too often, this never-ending quest to ameliorate—or what the Canadian anthropologist Tania Murray Li, writing in a very different context, has called “the will to improve”—is shortsighted and only perfunctorily interested in the activity for which improvement is sought. Recasting all complex social situations either as neatly defined problems with definite, computable solutions or as transparent and self-evident processes that can be easily optimized—if only the right algorithms are in place!—this quest is likely to have unexpected consequences that could eventually cause more damage than the problems they seek to address. This book exposes the threat of solutionism and proposes healthier ways to embrace and benefit from technologies. If you’ve spent much time listening to or reading the words of Silicon Valley’s prominent spokespersons (Kevin Kelly of IDEO, Mark Zuckerberg of Facebook, Eric Schmidt of Google, to name a few) you might have noticed that they tend to speak of technology as if it were spelled with a capital “T.” For them, Technology is a sentient being with purpose that, much like the God of evangelicals, has a wonderful plan for our lives. It is our job as believers to embrace Technology and let it lead us to the promised land, for it exceeds us in wisdom and power, and is unquestionably good. I’ve provided training and consulting services for many of the technology companies that preach this gospel. During these engagements, I do my best to moderate their techno-enthusiasm and point out that technologies are just tools that provide benefit only when they are well designed, capable of helping us solve real problems, and ethically used. We have choices when we approach technologies, and we should make them thoughtfully. Morozov addresses information technologies of all types and critiques them incisively from the perspective of history and a breadth of disciplines. Even such givens as Moore’s Law, which technologists often cite as the basis of their position, is revealed as a failed hypothesis—hardly a law. Technologists (especially technology vendors) use the term “revolution” much too loosely. What qualifies as revolutionary? Morozov argues that, “In order to be valid, any declaration of yet another technological revolution must meet two criteria: first, it needs to be cognizant of what has happened and been said before, so that the trend it’s claiming as unique is in fact unique; second, it ought to master the contemporary landscape in its entirety—it can’t just cherry-pick facts to suit its thesis.” No recent so-called revolution in technology fails to meet these criteria more severely than Big Data. Technologies are important. They give us opportunities to extend our reach and improve our world, but they also give us opportunities to do the opposite. Morozov understands this. He is not a Luddite, he’s a responsible technologist. I recommend that you consider what he has to say. I found the comment about technocratic solutions especially interesting. I keep thinking that the government is becoming responsible for more activities that used to be fulfilled by citizens and local groups. Even if a legitimate argument can be made that the government is better at providing many services, how do you build up responsible citizens and political morality if you remove all opportunity to exercise those skills. Sure, technology is not the solution. Except when it is. For every working technological solution there’s a social context that mediates whether or not it’s appropriate. In the case of Big Data, the mediating social context would be experts in statistics and particular problem domains who can separate real information from important-sounding Big Noise. This book sounds like a one-sided take on the situation described by Bruce Schneier’s book “Liars and Outliers.” Every system (technological, social, or bureaucratic) needs workarounds for emergencies and unforeseen circumstances. It takes time to figure out the workarounds. And even longer to put the workarounds into law or common practice. And for some systems, the workaround is to ditch the system entirely. I suggest that you read the book before forming assumptions about it. The assumptions that you’ve formed so far are mistaken. Morozov and I are both technologists. We believe in the potential of technologies. Well informed technologists, as opposed to those who are in the business of marketing technology, maintain a love-hate relationship with it. Morozov’s book is not one-sided; certainly not in the sense that you assume. He has a perspective that is perhaps better informed than anyone that you’ve read on the topic. The failures of technologies and our uses of them are not primarily due to the fact that they don’t address every situation and sometimes require workarounds. If only that were true. Technologies, when developed and used without proper vigilance, can be costly and harmful in ways that aren’t obvious. Both Morozov and I advocate a level of thoughtfulness about technologies and their use that provides a necessary counterpoint to the naive cheer leading that is common among Silicon Valley’s elite. Others do this as well. For example, Jaron Lanier, the father of virtual reality, provides another thoughtful counterpoint to the norm. I believe that you would derive great benefit from this book and encourage you to read it. This seems to be something of a ‘systems thinking’ approach. Does the thing you’re doing actually help to directly or indirectly ’cause’ the goal. Certainly the proliferation of BI tools seem to have encouraged people to collect, maintain and report on huge amounts of pointless transactional data, whilst simultaneously taking people’s eye off what is actually important to the business *and* making people think they’re more informed than they ever were — they just need some analytics to polish it off. I *knew* you’d really like his book. There moments where I forget if I’ve read something by you in Perceptual Edge or by Morozov in one of his articles. Really interesting post, I’ll definitely check out the book. I work in big data and predictive analytics, and it is refreshing to find writers (and thinkers) who aren’t always trying to get to the crest of the zeitgeist. In the article, Morozov talks about big data surveillance and how it focuses on simple correlations rather than real causes (because understanding the “why” is too expensive). As a result, we just implement quick fixes instead of dealing with the actual problems. Apparently sense-making isn’t a goal in “big data”. Who knew, right? Yes, what we have here is Big Data but Little Information. Seems to me I heard once how many millions are being made in Data Warehousing/Mining/Analytics aka BIG DATA, and I can’t remember the amount exactly, but I do remember it was staggering! Does that not answer the question? Morozov, Andrew Keen and Nicholas Carr are the essentials in my view. John Cornwell’s ‘Hitler’s Scientists’ is also a great historical perspective to link C19/20 European modern tech/positivist/determinists with our mostly American C21 postmodern versions. Interesting book–thanks for the recommendation. I’ve been meaning to read Jacques Ellul’s The Technological Society for a while but I’ve been looking for something for a little bit more nuanced. Ellul recognizes the limitations of technology but his solution seems too much of a throw-back for me. Being a technologist myself, I see that there are benefits to technology, so I’ll be curious to hear Marazov’s thoughts.